Hi folks! It's most definitely been ages and ages since I've posted. I'm so sorry! To say that life has been a little insane might be the understatement of the year. Hopefully my schedule is going to calm down a bit in the near future and I can get back to watching drama and blogging about it. On a funny note, all three people in my office watch K-drama and listen to K-pop...it certainly makes grading more fun. And warning, this post is going to be on the music heavy side, but not just K-pop. 1. VIXX are back!!!!!!!!!!!!!! Eternity most definitely doesn't disappoint (though I really wanted more Leo and less rapping). I'm also super excited for the live stage version to see the whole dance and to just watch and listen to them being amazing! The lyrics match the moodiness of the song and the song reminds me a lot of another song, but I just can't put my finger on it. And here's a link to a videoshoot from their pictorial for STAFF. Man, VIXX are some incredibly attractive individuals! 2. I know that Cunning, Single Lady finished a little while ago, but I didn't get to share this meme earlier, but it just totally cracked me up. I remembered thinking something along those lines while watching the drama scene. (I also happen to love Yiruma's music and the "River Flows in You" is my favourite. Needless to say, he would have won me over (before he went crazy). There's also an orchestral cover version by Héctor David Solis I recently found (if you love Yiruma). 3. IU recently came out with a rather lovely album called Kkot-Galpi: A flower bookmark that features some remakes of old classic K-pop songs and IU's take on them. I absolutely adore My Old Story. It's whimsical, sad, beautiful, and touching. The MV is also rather beautiful. I am actually really glad that the Eunhyuk scandal allowed IU to show a maturer image and get back to her original and more interesting style. I also really love her duet with Kim Chang Wan, Meaning of You. I was pleasantly surprised by how well their voices blend. 4. So...um...while I have been lacking on my Korean drama watching, the other night I was over at my BIGBANG road trip buddies' place and we watched a Korean movie and afterwards we ended up watching the first episode of the currently airing Taiwanese drama, Fall in Love with Me. I already adore Aaron Yan's music, and they have been raving about the drama...so they watched the first episode with. Yay for first Taiwanese dramas! While they're not as well produced as Korean dramas, they have an organic freshness and emotional honesty in their dialogue that Korean dramas lack. Also, Aaron Yan is pretty much so adorable, I could watch him just stare at something for hours. He has this absolutely cute and charming eye brow raise that he does and when he winked in episode 7, my fangirl heart definitely fluttered. So in honour of my debut into Taiwanese dramas (I've loved Mandopop for a long time), I'll share one of my favourite Aaron Yan songs, The Love Left. 5. The DramaFever post of "9 Things You Should Never Say to a K-drama Fan" was pretty hilarious and most definitely spot on. I am sure there are people who think I am odd for watching K-drama, but at least there are all of you and some of my friends who adore and embrace the K-drama watching. So thank you for that. 6. 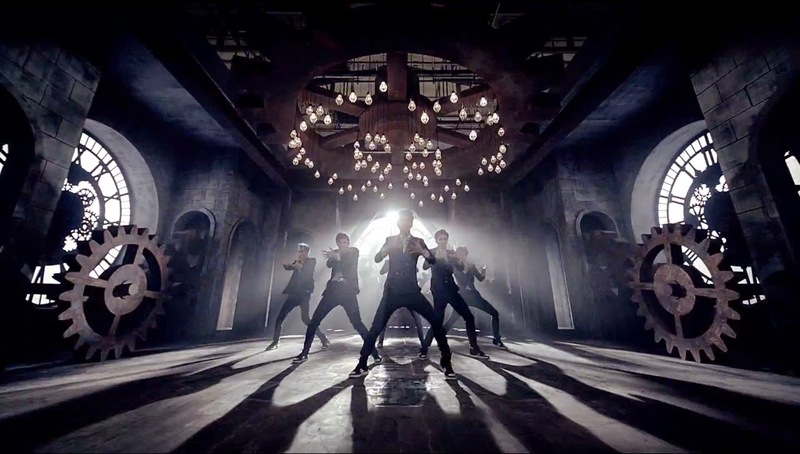 INFINITE made their comeback with "Last Romeo". I think it's not as good as "Destiny" but much better than "Man in Love" (though that's slowly growing on me too actually). "Last Romeo" is also getting better and better with each listen. I don't think it's really something super new for INFINITE, but it's still pretty solid and of course enjoyable. I think I will like this song more and more. The boys look and sound as fabulous as usual of course, though I'm no so sure about Hoya's blue hair. 7. EXO's recent release of "Overdose" [Korean][Chinese] was completely overshadowed by Kris' bombshell revelation that he was leaving EXO and suing SM to get out of his contract. I'm not going to take sides in this post as it will inevitably turn into some sort of crazy conversation. I will say that I agree with Heechul. Well, all that aside, I really loved this Chen & Baekhyun duet from Immortal Songs 2 of Kim Sanghee's "I Really Didn't Know" (Im Heeseok, the Korean Tina Turner made it famous later). I cued it from a little early on because there was some cute backstage conversation, but you can always skip ahead to 49:07 for the actual performance. Speaking of Immortal Songs 2, Wheesung and his dad gave a splendid performance. Wheesung and his father performed Kim Jung Ho's "White Butterfly". And here's an adorable little video of EXO-K about "Overdose". And "Overdose" is pretty awesome! I still get it stuck in my head. *sigh* EXO will never really be the same. 8. Baek Ji Young recently released a rather gorgeous song for Hyun Bin's latest film, The King's Wrath. Of course the MV for "Fervor" is a must watch because it's full of Binnie. I really I wished I lived close to a movie theatre showing the film. Soon, soon that won't be a problem ;) Baek Ji Young also just released another beautiful ballad (not for the movie) called "Still in Love". 9. This will sort of be a random category. Back in March 장미여관 (Rose Inn) released a really fun little number called "Twist King".Watch the MV, it's just fun and quirky and this track would be a fun one to play at a Swing dance. Back in 2013, the Korean Air Force released a hilarious parody of Les Miserables. I was just thinking of it the other day and wanted to include it here. I know, a little random, right?! If you haven't seen it yet, it's super funny. And no worries, they were nice enough to sub it as well. 10. And to finish off on a mellower note, Sungha Jung just made his first MV called "The Milky Way". What can I say?! He's just so talented and his guitar pieces and covers are always excellent. There's also just something about acoustic guitar that makes my heart happy. I hope you enjoyed this Favourite Finds post and I am going to try and be more active here again my friends. Let me know which music finds (and other favourite finds) you've recently discovered. And let me know which K-dramas I need to watch right now. I am thinking about starting Angel Eyes and A Witch's Romance, so let me know what you think and which others I should add to the list! Have a lovely week everyone! Welcome back, dewaani!! :D Yay that you had time to post! Boo that you've been so busy, but it's cool that you have colleagues who are into kdrama and kpop too! Instant bonding! ;) Lol at the military's parody of Les Miz.. I saw that one a while ago, and was suitably amused. I think it's so cool that they would spend time doing something like this! It really is great to have colleagues who are into my K-ent world ^^ I also really like the ROK parody. What have you been watching these days? Anything I should pick up? ㅋㅋ Let's Eat has definitely become one of my all time favourites. Of course it doesn't hurt that Doojoon (my BEAST bias) stars and does a pretty dang good job of it ;) Just thinking about that drama makes me hungry! I think that is one I am going to have to rewatch sooner rather than later! I'm not big on adultery storylines either, but I am definitely curious about SLA and what makes it tick. One ep into SLA, I'm getting the feeling of a very well-made show with the sensibility of an art film rather than a kdrama. That makes it intriguing. So far, characters are fleshed out in organic and believable ways, and I'm curious to see where the show goes with it. I think I am slowly coming around to the "no live watches" method. There's something about being burned by bad endings ;P Then again, it's fun to chat with everyone while it's airing. I'm torn about it. And I look forward to your SLA updates! 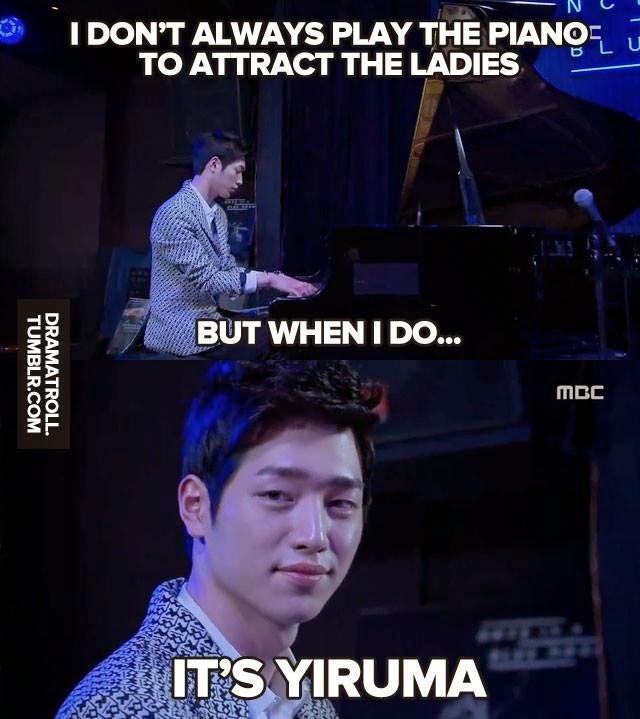 Yeah, playing Yiruma's "River Flows in You" is probably the easiest way to pick up a girl. Though it doesn't hurt to look like Seo Kang Joon....oh, he's so dreamy. Isn't it funny how IU actually seems to have benefited a lot from her scandal with Eun Hyuk? She got to change up her image and did it really successfully. Sure there were people crucifixing her online, but she did not let it get to her and she's doing so well right now. And I personally have gained a lot of respect for her during this time. She proved she can be a good leading lady in dramas and produce some awesome music at the same time. Pretty proud of her. Haha, you still haven't finished Lee Soon Shin? XD I finally did it, but boy did it take a lot of willpower. And I fast-forwarded a lot in the final episodes. But I'm glad I finished it, even though it was probably not worth my frustration. Done and over with. Except that I have to also finish my review for it...and it's going slowly.